Manassas Adventist Preparatory School (MAPS) is very excited to present a new Children’s Christmas musical by Dennis and Nan Allen: The Next Noel. 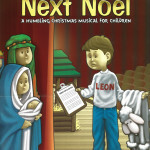 This time is the sequel of the very successful 2012 musical: The First Leon. Leon is again the center of the action, only this year, he, having matured from the simple state of understudy, is directing the Christmas pageant. He has grand and lofty dreams and expectations for the program. However, the closer the cast gets to opening night, the more wildly overstated and ridiculous Leon’s ideas become – and more importantly, the more the program becomes all about Leon’s initiative instead of God’s miracle at Christmas. An event the night before is about to change it all. He then, will realizes that humble worship is exactly what our response should be at Christmas and all lifelong. Bring all your family to this event filled with new songs and traditional carols that we all know!